He is a young Startup, full of passion, looking for a partner with the right skills. But he’s careful with his cash. She is a Freelancer: knowledgeable, with little baggage, and promises to get the job done at a great price. They meet each other. This feels like the beginning of a beautiful friendship. Will it be? So what is it like for a startup to work with a freelancer? Can you really get value for your time and money? What are the upsides? And what should you watch out for? We decided to ask startups some of these questions. 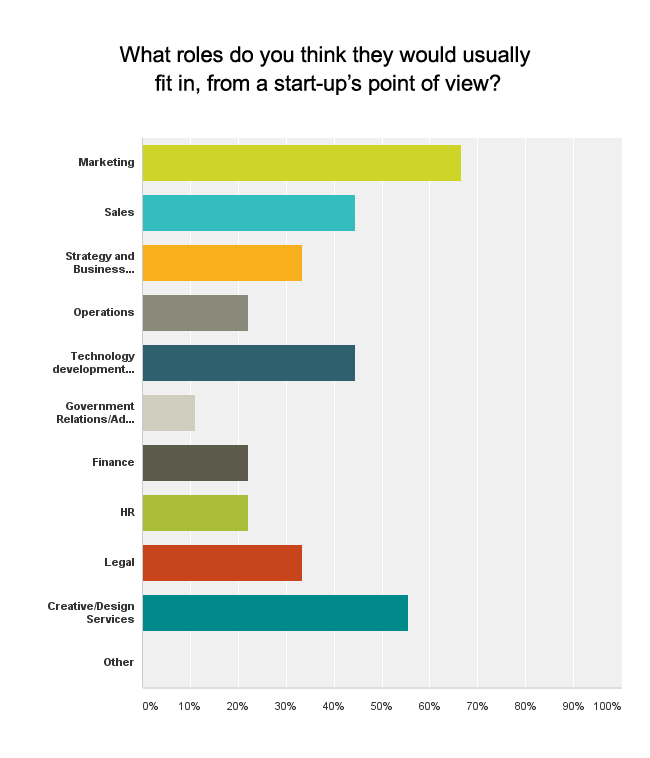 A few weeks ago, Flexing It ran a survey for startups to find their views about freelancers. Thirty-six startups took part in this and close to 70 percent had been launched in the last three years. They were from a wide range of industries and backgrounds. While IT services and technology start-ups constituted a quarter of them, there were representatives from Education, Retail/e-commerce, Telecom, Healthcare, and Financial Services. About 40 percent of the start-ups were in a stable first stage, with a product out and being marketed to early adopters, with an additional third being in rapid scale-up mode. Importantly, three out of four startups in the survey were self-funded or financed by friends or family, so they were likely to be extremely cost-sensitive. When asked about their top challenges, “hiring the right team” emerged as the top-most priority in the survey. This was followed by sustaining high revenue growth month after month and getting operations streamlined. About 75% of the respondents had worked with freelancers, primarily in the areas of technology development and creative services, but also interestingly for marketing & sales, strategy development, and operations. 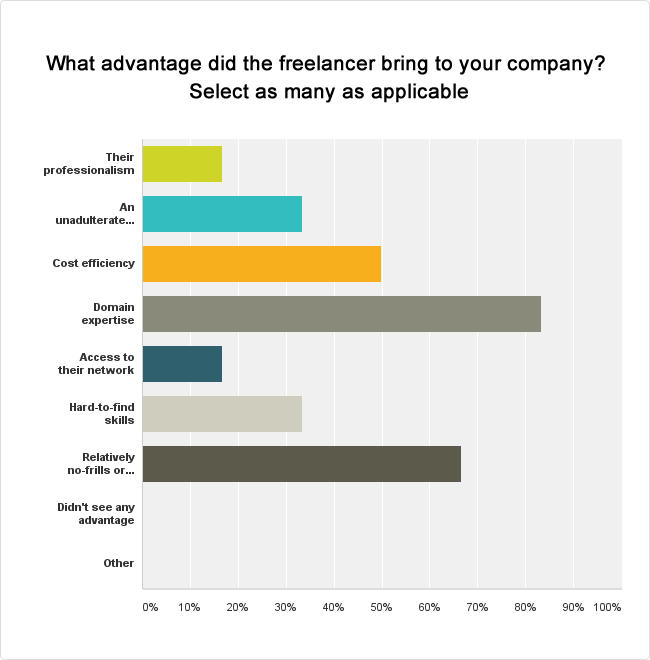 Of the startups who had worked with independent professionals over 75% said they had a positive experience with freelancing and just under a quarter were not satisfied. For the latter, the biggest issue identified was timely delivery (incidentally, this aspect also came up with those that had positive experiences.) followed by some respondents who felt that the delivered output didn’t have the quality expected. Some startups did not explore the option of working with independent professionals because they were convinced they needed someone in-house and full-time. But the majority – two-thirds – were open to considering the idea but didn’t know how to go about finding good flexible-workers. Flexing It spoke to a few startups in more detail. What led startups to have these good experiences? For many, the most important benefit was the domain expertise of the freelancer. Rashmi Vittal Kudva runs Little Green Kid, which offers organic clothing for children. For Rashmi, hiring the right experts was extremely important to her business. She did not want to spend time and money getting full-time but lesser qualified employees who would need the training to do the job. This was a key lesson from her previous experience running a startup. This also made sense to Manuraj Jain of Vinculum Capital Partners(a boutique capital advisory firm), especially because all partners in his company are independent professionals. Each of them specializes in specific areas and has at least a decade of experience behind them. Domain expertise is critical to his business model. The next most important benefit to startups is easy to guess: saving costs. Startups are extremely cost-sensitive. Working with independent professionals on a project-to-project basis helps startups get great talent at affordable costs. Venkatesh Varadachari is a co-founder of Money-Wizards, which works in the area of providing user-friendly financial literacy and has hired over 25 freelancers across training, content design and sales over the last two years. According to him, this helped keep their fixed costs low and it would not have been viable to hire such people as full-time employees. These cost savings also came from very few overheads. Freelancers often worked remotely, saving the need to provide office space or desks. They had their own tools and didn’t need additional training. Wishberry is a crowdfunding platform for creative projects. The startup has even worked with relatively inexperienced freelancers fresh out of college. What, it loved about such professionals was their outside-in approach, having the ability to see things with a fresh mind. A lot of the engagements of start-ups with freelancers have involved technology or creative services. Often, this is because startups need to create websites, worry about user experience issues, populate online properties with great content, and create logos or other communications. Since it is common for these skills to not be available in-house and for these to be converted into well-defined projects, they get outsourced to freelancers. However, a startup like SecureNow(a startup in the insurance broking space) has even used independent or flexible-workers in roles such as business development, market research, and client acquisition. According to Kapil Mehta, a co-founder, their freelance partners work only for a few hours each day but make them count, and have even been able to build excellent relationships with clients. Other startups have now begun venturing into working with experienced professionals on business strategy and consulting on operations. Another avenue that is taking-off is bringing seasoned functional professionals on board – in key areas like HR, finance, legal – on a part-time basis to help young firms establish the key systems and processes that are needed to support growth. But not all areas are perfect fits for freelancers. Wishberry chose not to work with freelancers on areas such as social media because they felt this was a fast-moving field which an agency with in-house expertise was better equipped to handle. So what was the engagement model like? When these startups hired freelancers, they paid a great deal of attention to the past experience and projects of the freelancers. For Little Green Kid, it was important to be choosy about getting the person with the right attitude and values. Vinculum echoed the same approach, preferring to wait for that almost-perfect partner. Anshulika Dubey of Wishberry emphasized looking for reliable references for the potential hire, in addition to portfolios and skills. It could even come down to logistics: Kapil Mehta of SecureNow recounts a case when they wanted someone to visit their office each day, which the freelancer wasn’t able to do. When it came to processes, most startups understandably preferred not to be too bogged down by formal procedures. They evolved their own lightweight practices to make sure communication was smooth and schedules were being tracked. At Wishberry, freelancers often meet with members of the startup once a week in person and are asked to make monthly reports. The company has a dedicated person to engage with the freelancer to ensure progress is being made and uses tools such as Google Docs for documenting various details. OK, so a startup has hired the best possible independent talent at the right price. What should they watch out for next? When asked about what factors could make or break the experience, most startups spoke about the clarity of requirements, great communication, and timeliness. For Little Green Kid and Wishberry, it comes down to having great clarity on knowing what the company wants out of the engagement and communicating this in great detail. They try to bring a detail-oriented approach to task management, to ensure there are no surprises even in a fluid environment. Startups underlined the need to understand the objective of a project, rather than expecting the outsider to “get” what’s needed. The time management of freelancers has been a mixed bag for many startups, so they advise caution in this area when a startup deals with a freelancer. Buffers in schedules, some oversight, and careful communication are prescribed to not let this sting the core operation. So should a startup take the plunge? Would these startups recommend freelancing for others? Yes! For Money-Wizards, using flexible-hiring is an effective way to start and grow a bootstrapped business. SecureNow would even go as far as to tailor the job to fit a good freelancer rather than find a freelancer to fit the job. Working with independent professionals is a natural option for start-ups looking to flexibly plugin great talent at affordable costs. As the Flexing It survey shows, startups have had a variety of experiences with freelancers, each providing much fodder for learning to do it better the next time. What’s your experience been like working with freelancers? We’d like to know! Make use of the comment form below to share your story.